TUCSON, Ariz. — President Trump is focusing on Arizona's border in a tweet posted Thursday night. The tweet comes just hours after Congress passed a stop-gap measure to keep the government from shutting down. The bill only extended budget talks for two weeks. Sources say the biggest sticking point for both sides of the political aisle is the border wall. 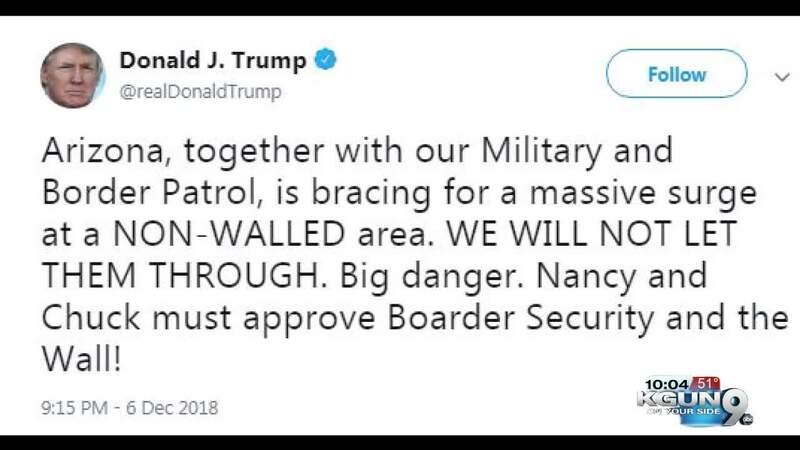 In the tweet, President Trump said "Arizona, together with our military and border patrol, is bracing for a massive surge at a non-walled area. WE WILL NOT LET THEM THROUGH." Trump added that Nancy Pelosi and Chuck Schumer must approve funding for border security and the border wall. The new deadline to pass a funding bill which would prevent a government shutdown is Dec. 21.